Samurai Shodown 64: Warriors Rage, known as Samurai Spirits 2: Tale of the Murderous Demon Asura (SAMURAI SPIRITS 2 ～アスラ斬魔伝～ Samurai Supirittsu Tsū: Asura Zanmaden) in Japan, is a 3D fighting game produced by SNK for its Hyper Neogeo 64 system. It is the followup to the original Samurai Shodown 64 on the same platform, and like its predecessor, it received relatively no distribution outside of Japan. After the lukewarm critical and fan reception of the previous Samurai Shodown game, SNK listened to customer comments and complaints, and set about trying to restore more of a two-dimensional feel to the gameplay, in order to draw fans who enjoyed the earlier iterations of the series. Asura, a revived warrior with the power to summon seven weapons, who wants to destroy his old opponent, Yuga. Taizan Morozumi, a warrior who wants to avenge the death of his wife and son, both killed by Yuga. In spite of all the positive changes, the game still met with average reviews, not helped by the platform's meager graphical capabilities when compared to other contemporary arcade hardware, such as the Sega Model 3. 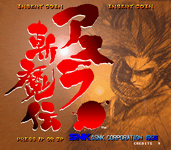 The game experienced a minor revival in the form of a scaled-down 2D "port" for the Neo-Geo Pocket Color, entitled Samurai Shodown! 2. It included the entire cast except for Hanma Yagyu, and re-added Charlotte and Jubei. Source: Wikipedia, Samurai Shodown 64: Warriors Rage , available under the CC-BY-SA License.